Nowadays, if there is one part of the world that repeatedly finds itself in the midst of some conflict or the other, it has to be Western Asia, which is more commonly known as Middle East. Looking at the present-day map of Middle East is a confusing and heart-breaking experience. There are random boundaries separating one state from another, and issues such as terrorism, political strife, corruption, etc. are rampant. However, it was not always this way. Not so long ago, Middle East was the pinnacle of peace and prosperity. So what went wrong? In this rather long essay, I will try to explain the root causes of the ongoing strife in the Middle East. Before going any further, let’s make it clear that “Middle East” is a term invented by the West, and is thus a product of Eurocentric definitions of geography and history. West Asia is a better term, but for the sake of clarity, and also because Middle East is more common, I’ll stick to that in this essay. West Asia was always a prosperous region, and even though it did face its own times of crisis, never was it so badly fragmented. Under the guidance of Prophet Muhammad (PBUH) and his companions, especially Umar ibn al-Khattab (RA), the warring Arabian tribes and states were unified into one coherent nation. Following that, under the Umayyad and later on Abbasid Caliphate, West Asia as well as many nearby regions, including East Europe, Central Asia and South Asia, became part of a large multi-ethnic and culturally diverse state. Eventually, regional empires and superpowers came up, such as the Mughals in South Asia, and later on, control of the Middle East passed on to the Ottoman Empire. Ruling from Istanbul, the Ottomans controlled a major part of the Islamic world, including most of Middle East and a good part of North Africa. At this stage, nearly all of the Middle East was one united nation-state, nothing else. Present-day borders and artificial sense of nationalism were not around. Unfortunately, all of this changed with the advent of the 20th century. When World War I broke out in the summer of 1914, arms race, colonial ambitions and alliances of convenience knew no limits. Most of the European powers were involved in the War, with Britain, France and Russia making up the Allied side, whereas Germany and its partners forming the Central Powers. The Ottoman Empire wanted to remain neutral in the War, simply because there were already too many internal and external issues that the Ottomans were dealing with, and an unnecessary war would not have helped them by any means. Yet, neutrality was hardly an option during World War I, so the Ottomans were compelled to join forces with the Central Powers. One might ask: why Central Powers? Well, the Ottomans did want to cooperate with the Allied forces, but Britain and France had ulterior motives. Britain, already in control of India and various other colonies, and France, already in control of its African colonies, clearly wanted to destroy the Ottoman Empire and divide the Middle East among themselves. Colonialism thrives on greed, after all! Britain and France followed a rather well-planned policy, and did not outright dismiss the Ottoman rule. Here is how things turned out to be. The first step in this process was to encourage the Arab residents of the Middle East to revolt against the Ottoman Empire. By creating a fake sense of nationalism among some of the Arabs, and by dividing them as Arabs versus Turks, the British planted the seeds of Divide et Empera in the Middle East. They also found a helper in the form of Sharif Hussein bin Ali, the then Governor of Mecca. A false promise was made to Sharif Hussein: he would be made the ruler of an all-Arab nation-state that would be created in the Middle East. 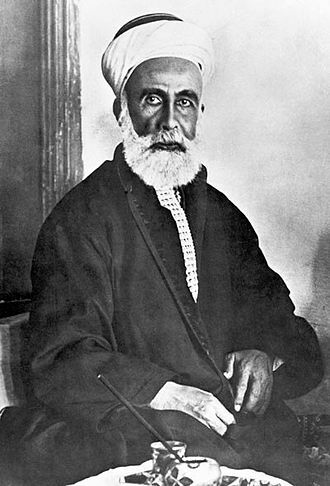 Unhappy with Ottoman rule, and filled with unwanted ambition, Sharif Hussein gladly assisted the British. 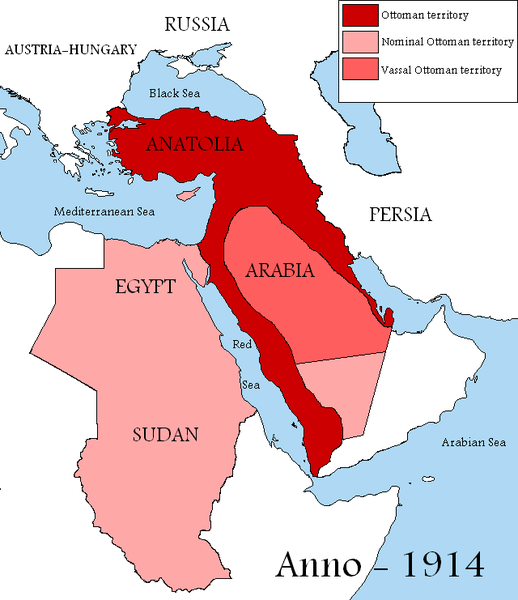 Between 1916 and 1917, the Arab rebels, aided by British navy and army, revolted against the Ottomans and captured various key territories. They also helped the Allied forces in capturing important Ottoman cities, such as Jerusalem and Baghdad. One might be tempted to assume that the Arab Revolt was a popular rebellion, but this was not the case. Most of the Arabs refused to revolt against their Ottoman brethren: it was basically a mistaken and over-ambitious rebellion of a handful of Arab tribesmen and leaders. The majority of Arabian populace remained aloof from the revolt. At this point, Sharif Hussein might have felt pretty certain about his dream of having an all-Arab nation-state. But little did he know — the Allied forces were trying to colonize the Middle East, not liberate it. In the winter of 1915-16, two diplomats, Sir Mark Sykes of Britain and François Georges-Picot of France, decided to seal the fate of post-Ottoman world once and for all. 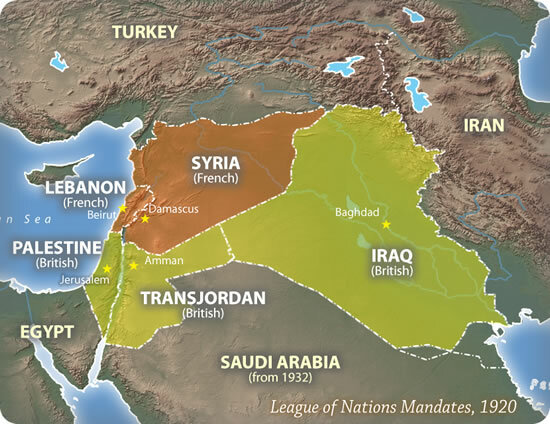 The Sykes-Picot Agreement, as it was commonly termed, was a secret arrangement between Britain and France wherein both the parties agreed to divide up the Arab world between themselves. Britain would take up present-day Iraq, Kuwait and Jordan, whereas France would control present-day Syria, Lebanon and parts of Turkey. Palestine’s issue was to be determined later, by taking the needs of the Zionists in consideration. In essence, both Britain and France intended to divide and sub-divide the Middle East, and bring its nominal rulers under their influence. However, this secret agreement was exposed by the Russian Bolshevik government in 1917. The Sykes-Picot Agreement was a direct violation of the promises that were made to Sharif Hussein and his troops. Naturally, this led to considerable tensions between the Arab rebels and the Allied forces, but it was too late for the Arab rebels to mend anything. The Ottoman Empire, the axis mundi of the Islamic World, was already falling apart. But that was not all. There was one more group that wanted a piece of the cake: the Zionists. Zionism began as a political and religious movement in the 1800s. Its aim was to create a separate country for European Jews: anywhere in the world would be fine, as long as Jews had a country that was exclusively theirs and everyone else was a second-rate citizen. After Britain and France decided to divide up the Middle East, Zionists saw an opportunity in Palestine. By expelling native Palestinians, Zionists intended to create their Jewish state in Palestinian territory. There were many within the British government that had open sympathy for Zionism, and one such person was Sir Arthur Balfour, the Foreign Secretary of Britain. On November 02, 1917, Balfour sent a letter to Baron Rothschild, a Zionist leader, highlighting his intentions of setting up their so-called Jewish state in Palestine itself. By the end of 1917, Britain and France had succeeded in their objective. They had destroyed unity in the Middle East, crippled the Ottoman Empire beyond repair, and secured their colonial ambitions. However, in doing so, they had also created a jigsaw puzzle that no one could comprehend. On one hand, Sharif Hussein and his troops expected the Allied forces to keep their promise. Sharif Hussein had little regard for regional unity or even nationalism. All he wanted was a sovereign Arabia with himself as the leader of the nation. On the other hand, there were Zionists who had already made up their mind to colonize Palestine and set up a new Jewish country therein. Lastly, even though destroyed and heavily overpowered, the Ottoman Empire was still not willing to give up. The Ottomans would continue to exist until 1922, even though they were powerless and all of their lands were under foreign occupation. To solve this crisis, the League of Nations (a forerunner to United Nations) came into the picture. It decided to set up “mandates” in various parts of the Middle East — each Mandate was to be ruled by either the British or the French, until self-rule was eventually granted. Yes, subtle colonization at its finest! Zig-zag borders were placed with zero regard for ethnic, geographical, national, linguistic, or any other such factors. Random lines were drawn and new countries created out of nowhere. Since these countries were created without taking into consideration the needs of the people, most of the “new” Middle Eastern states turned up to be volatile and dysfunctional, and they continue to be so even to this day! Efforts were made to foster a false sense of nationalism among the local populace. For all practical purposes, they were all Arabs, but fake differences such as Syrian, Jordanian, Iraqi, etc. were created. To pacify Sharif Hussein, his sons were allowed to rule some of these new states, but only under British or French supervision — much like the vassal princely states of South Asia or Africa. When talking about false divisions in the Middle East, Iraq deserves a special mention. Home to the Mesopotamian Civilization during the ancient times, the region that is today known as Iraq rose to prominence during the 8th century, when Baghdad became the capital of the Abbasid Caliphate. Baghdad and its nearby regions would continue to be the biggest attraction of the world, until the Mongol onslaught led to widespread destruction of life and property. During the Ottoman rule, the land between the rivers Tigris and Euphrates was organized into three separate provinces. The term “Iraq” as a country was unheard of. In fact, “Iraqi” as an identity just did not exist: people were Kurds, Arabs, Turks, Armenians, etc. but Iraqi was not an ethnic or regional identity. However, when Britain and France decided to take control of post-Ottoman Middle East, they created arbitrary boundaries to divide lands between themselves. It was at this point that Iraq came into existence. But arbitrary borders and false nationalism cannot hold a nation together. Iraq consisted of people who came from different backgrounds, and most of them failed to subscribe to this new Iraqi identity that was being forced down their throats. In the northern part, Sunni Kurds felt alienated from the rest, whereas in the central region, Sunni Arabs too felt the same. Similarly, in southern Iraq, Shi’ite Arabs also had a hard time swallowing “Iraqi” as their new identity. Now, while the European colonial masters had no clue about the dysfunctional diversity that existed within this newly formed state of Iraq, the regional leaders who were put in charge of the new country were better informed. King Faisal I, son of Sharif Hussein, realized that his newly formed country needed to foster nationalism in order to stick together. He promoted the concept of pan-Arab nationalism, rising above the Sunni and Shi’ite rift. For the time being, Iraq managed to stay unified, but such unity came at a price: a dictatorial regime with an iron fist was the only thing that could keep Iraq intact. This is precisely why Iraq would later see leaders such as Saddam Hussein coming to power — anything else would lead to a breakup of Iraq as a country. Currently, Iraq is again being pulled apart in different directions. Iraqi identity is still an unsolved issue. The rise of groups such as ISIS shows that false sense of nationalism is unable to hold Iraq together, and until the Middle East is unified once again, terrorism and dissent will continue to rule the region. 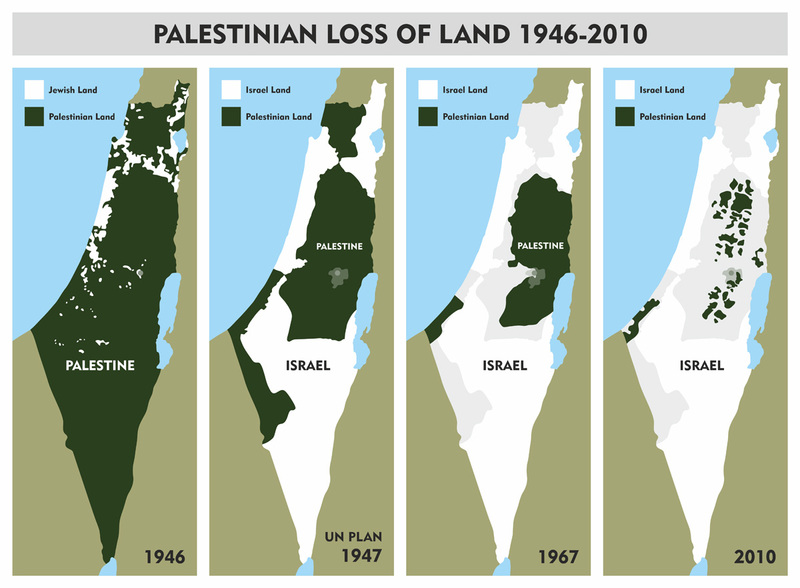 The issue of Palestine is another concept that often surfaces in the news. However, as old and well-known as this issue might be, it is shocking to see that a good number of people are either ill-informed or uninformed when it comes to Palestine. Palestine’s troubles began in the 1800s, when Zionism emerged as a movement in Europe. As already mentioned, the Zionists intended to create a separate state meant exclusively for Jews. Attempts were made to acquire land in various parts of the world, but it is not everyday that you can grab enough land to build a new country! Zionists got their opportunity after the First World War, when Palestine became a League of Nations Mandate under British supervision in 1920. Following the Balfour Declaration, it was only a moment of time before Palestine would be usurped by Zionist settlers. Consider this: in 1922, there were 83,790 Jews in Palestine. By 1945, this number had gone up to 553,600. In 1948, Britain decided to end its control over the Palestinian Mandate. As per the United Nations plan, Palestine was to be partitioned into two states: one for Jewish settlers and the other for native Palestinian Arabs. Quite obviously, the Arabs were not too pleased with such a verdict: in a nutshell, the land which had been theirs for centuries was being taken away and given to foreign settlers that had infiltrated Palestine forcibly. Conflicts grew, and Zionists refused to respect any international law. Ultimately, in 1948, the Jewish State of Israel was created. It was at this point that the Arab states decided to fight Israel. However, there was not much that could be done: all the Arab states had been weakened owing to their own mutual differences as well as British plots to destroy and divide the Middle East. The result of this war was that Israel grew manifolds in size: it acquired as much as 50% of land in addition to what was originally offered to Israel by the United Nations. Palestinians became refugees in their own homeland. Many were forced to leave their homes and seek refuge elsewhere, whereas many others were slaughtered, and still others went missing. This travesty is not over yet: even today, Palestinians are still forced to live in refugee camps, and Israel continues its occupation and blockade of Palestinian territories. Palestine is not even recognized as a country anymore by several Western states, and the original inhabitants of the region watch in horror as Israeli settlers continue their advances and rule the country will no regard for human rights. Almost a hundred years have passed since then, but the political mess that Britain and France created in the Middle East to satisfy their colonial ambitions remains alive even today. Palestine suffers everyday, and so do other states such as Syria and Iraq. Certain states in the Middle East, such as UAE, Saudi Arabia, Qatar and Kuwait, have managed to establish themselves as viable economic superpowers, but only with Western help. Owing to their natural resources such as oil, some Middle Eastern states are now witnessing a period of prosperity. Yet, such financial growth comes at a big price. Political stability and diplomatic prowess are somewhat volatile, as USA and its allies still continue to interfere in the affairs of the Middle East, all for their greedy interests. False divisions, improper and artificial borders, and foreign interference — all of this has led to the breakdown of the political apparatus in the region. Fromkin, David. A Peace to End All Peace: The Fall of the Ottoman Empire and the Creation of the Modern Middle East. New York: H. Holt, 2001. Hodgson, Marshall G. S. The Venture of Islam: Conscience and History in a World Civilization. Chicago: University of Chicago, 1974. Hourani, Albert Habib. A History Of The Arab Peoples. New York: MJF Books, 1997. Ochsenwald, William, and Sydney Fisher. The Middle East: A History. New York: McGraw-Hill, 2003.